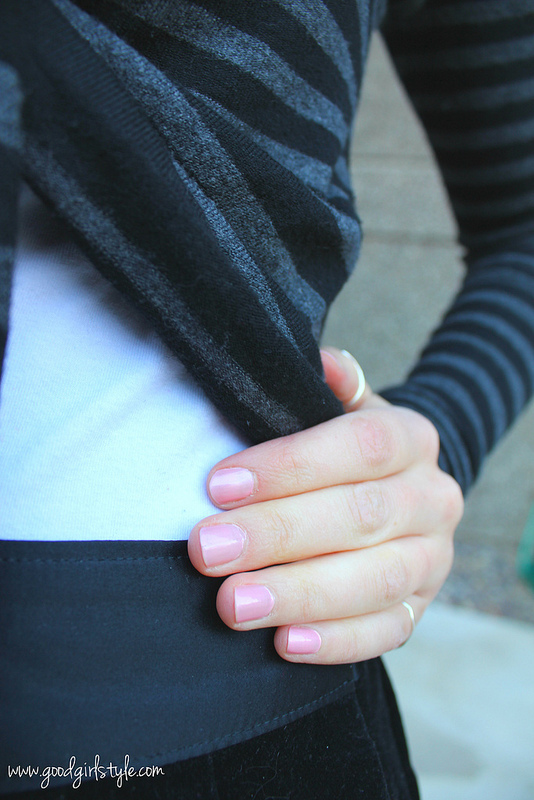 Oh stripes, how I adore you. Oh cupcake hair, how I adore you (see, cause my bun looks like a swirl of frosting?). Oh giant sunglasses, how I adore you. Also adoring these new lace-up boots that were a bit of a steal from the consignment store. I bought a bunch of clothes to the consignment store the night before my move. My car was already packed to the hilt, and I was entirely exhausted, but I had one bag of "good" clothes that wasn't coming with me. I used the credit I earned for these boots, knowing full well I had absolutely no room in my car for them. In desperation, I managed to cram them under the front passenger seat. I think it was worth the effort, because of their shearling lining, lace-up front, and Chukka-boot styling. What do you think? Ok, now I'm excited to share the best part of this post! I think you all know my penchant for wearing skirts and dresses in winter, since the "how-to" it is my most popular post. 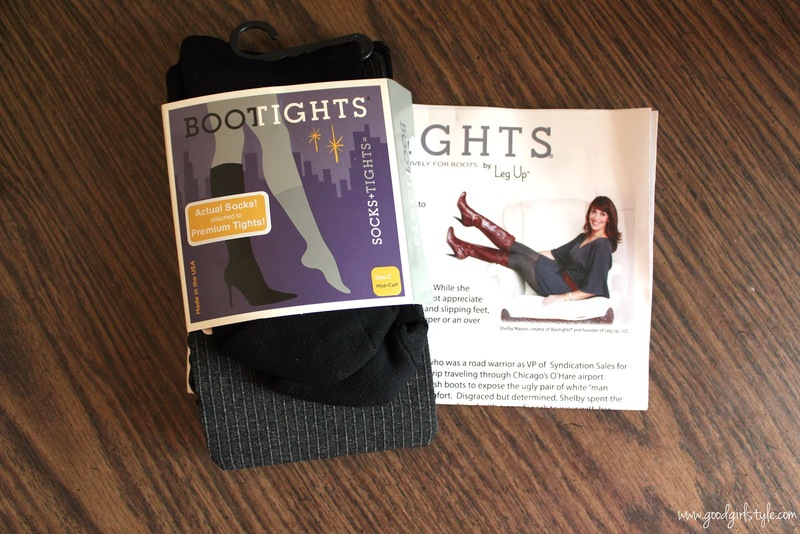 Well, I am just so excited to have something totally new to add to my winter wardrobe: Bootights. You guys, it's a tight with a sock, too! I'm really just thrilled to have found this company. Their thick, premium-quality, made in USA tights combine a sock into the tights so that you don't have to ruin your tights in boots, have your feet be slipping inside boots, or layer thick or unsightly socks over your own tights. You know exactly what I'm talking about, right?! It can get ugly when you have a gorgeous outfit on and then throw on cheesy off-season holiday socks over your tights in your boots because it's all you could find....only to show up for a fancy dinner party and be asked to take off your shoes. 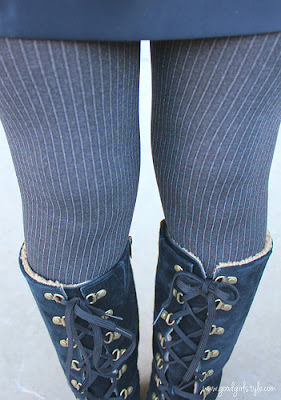 These are the Flannel Pinstripe tights. They are really thick and luxurious, with a very thick and cozy calf-length sock attached to the tights. I was worried that the seam attaching the two would be flimsy and cause them to rip, but that doesn't seem to be the case at all. The sock makes these tights especially warm inside boots, and I felt cozy and comfy all day, even in my 'dressier' boots. The tights definitely have a control top, so be aware for those holiday food-laden parties ;-) They have many patterened tights that will be perfect for the upcoming festive party season (click on the title of the tight for more info)! I'm going to update my "How to Wear Skirts & Tights in the Winter" post this year, and I will be SURE to include this amazing new find. If you live where it's cold, these are an incredibly valuable addition to your winter wardrobe. They are a little pricey, but they are made in USA and definitely high-quality. When it comes to tights, I've noticed that you really get what you pay for. And there's always Santa! Seriously, these would be great (and punny) stocking-stuffers. Now, I just need to get their other cute ones. I'm thinking Herringbone and Clark Cable (ha). *These tights are c/o Bootights in exchange for the words, images, and opinions in this post, which are my own, honest and unbiased. Thank you, Bootights!